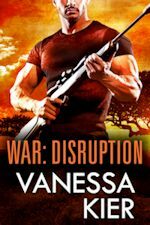 WAR: Disruption is part of a Buy 2 get 1 Free promotion over at Kobo. Only certain titles are eligible. If you like mysteries and thrillers, Allison Brennan and Toni Anderson each also have a book in the promo. Check out the full list of eligible titles here. You may have to click the Show More button a few times to see all the way to the bottom of the list. The promotion continues through February 1st, 2016.